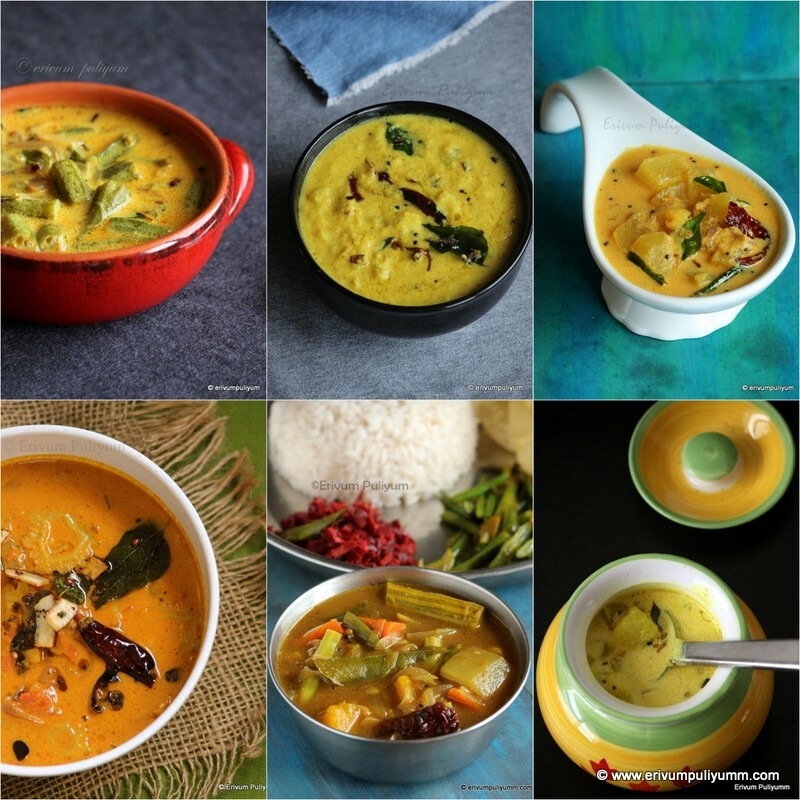 Erivum Puliyum: Squid Curry | Kanava Curry & A Gift Voucher !! Hope everyone had a great Christmas. Thanx everyone for the wishes through mails,comments & fb messages.We had a very good celebration too !! I have another good news to share with you all,got a really surprise gift voucher for participating in "Street food of India"event hosted by Rosh @ Chef Al Dente.This is my first ever gift voucher/gift from the blogging world,am so happy to receive it yesterday as Santa's gift to me.My recipe of Beef roast got selected and a big bunch of thanks,Rosh for the wonderful gift voucher. Back to blogging after the zeal & blast of Christmas with a delicious squid /kanava curry.Squid /Kanava was first introduced to me five years back in Trivandrum.That's the first time,I first noticed this fish.By the looks & feel,its very slippery & slimy but once cooked becomes like meat or thick rubberband like.And it was our neighbour aunty who explained me the recipe to prepare squid curry and I followed it thereafter.We all loved the curry and so bought it often.This fish is rarely seen at my home town and husband's place too.So,do try this curry if you get squid at your place & Enjoy !! -Clean the squid by clearing the inner cavity and peeling the slippery skin.Cut into round pieces and if its very large ,cut in smaller pieces.Wash,drain water and keep aside. 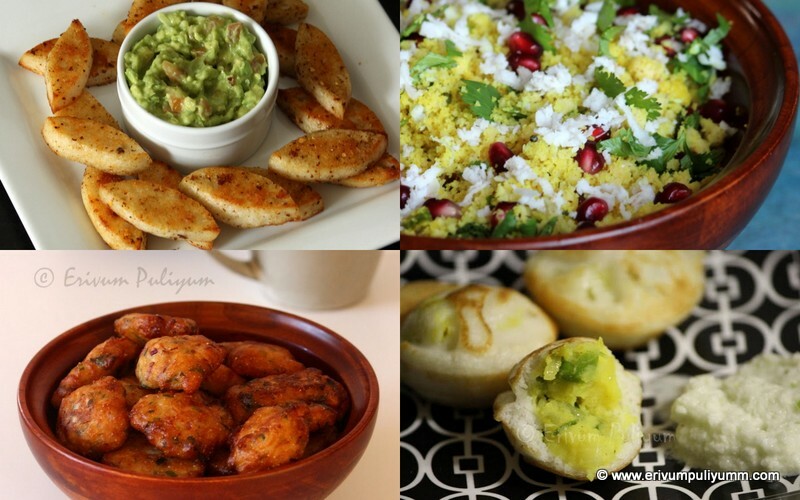 -Heat oil in a pan and fry the coconut slices till slightly browned. -Slide in the onions and saute the sliced onion till slightly caramelized.Add in curry leaves.Add the ginger- garlic paste and saute till raw smell disappears.Add in the spice powders and saute on low flame. -Add in the tomatoes,cook well till mashed.Add salt. -Add the squid pieces and cook covered till 15 minutes until the squid pieces turns firm and cooked. 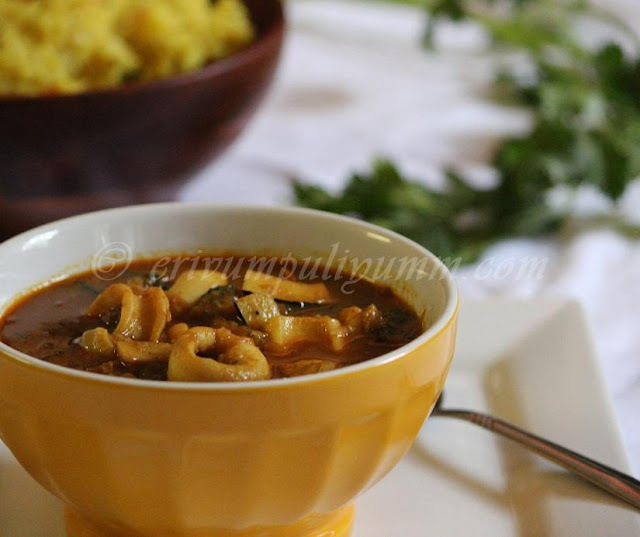 -Adjust salt & the gravy consistency as per your wish.Add the cilantro and put off flame. 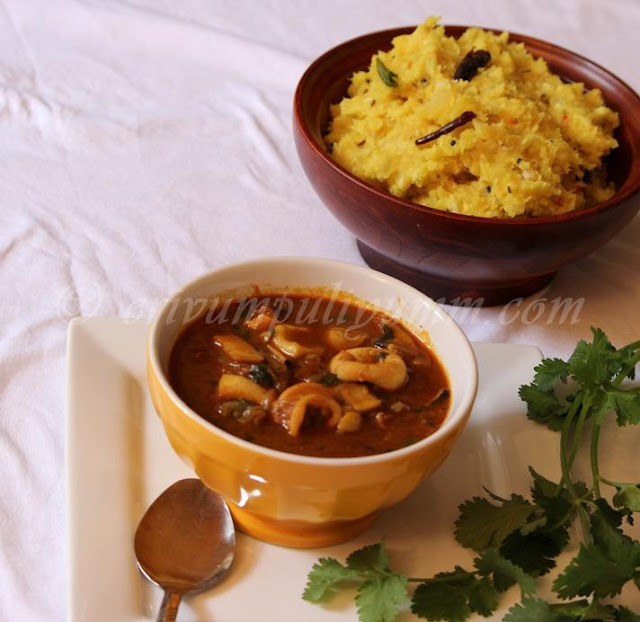 -Serve with kappa vevichathu or rice or even chapathis !!! * Adding coconut slices adds to the taste.You may add or leave. * Adding cilantro is optional. 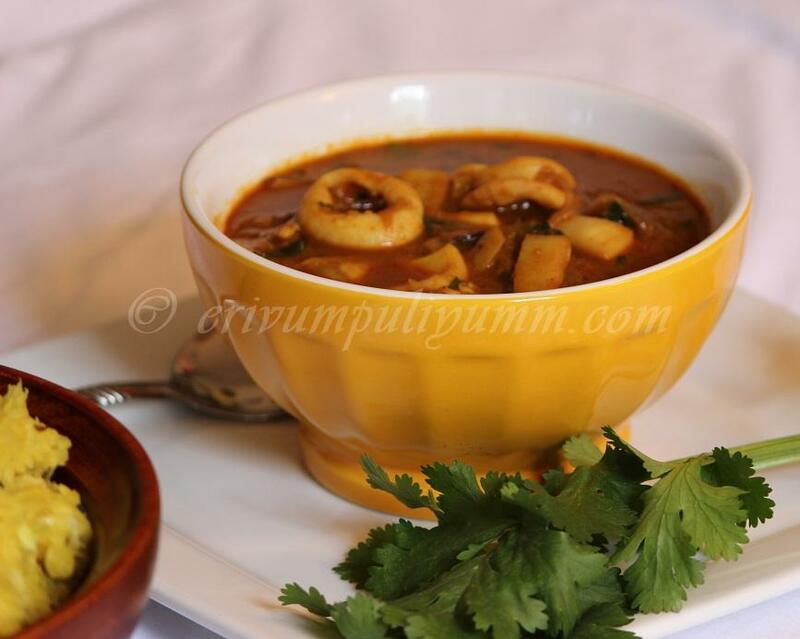 * We had squid curry with kappa vevichathu,makes a great combo. 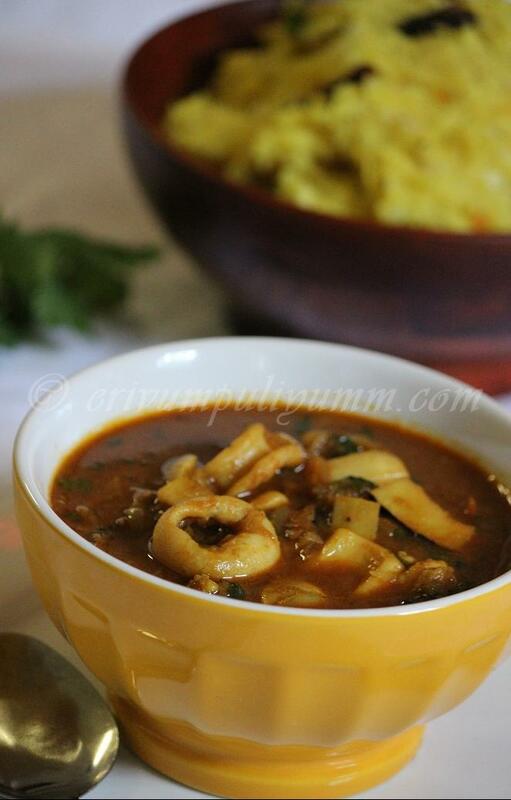 Hope you had a wonderful Christmas.. Congrats on winning the voucher.. And squid curry looks delicious..
Lovely gravy. can't comment on squid though. OMG, Kappa and spicy squid curry...enikku vayya! :-) Vaayil vellam varunnu! Congratulations. Nice rich gravy for the squid curry. Delicious squid curry Julie, congrats on your gift voucher. I would be happy, if you stop by mine too. Delicious and inviting squid curry! Never tasted this earlier...Looks spicy and yummy..
Never tried Squid curry. Loving the combo..
Julie...Curry looks very delicious and inviting. Wonderful curry...and love that wooden bowl you have in the background! Congrats on the gift voucher as well! Congrats on Winning dear...That's always a pleasure and encouragement. Isn't it ? I love squid and it seems your curry is simply delicious..Love to try this once.Thanks and have a wonderful,peaceful 2013 ! Superb combi. They r so so tempting. Never tried squid..but looks delicious. 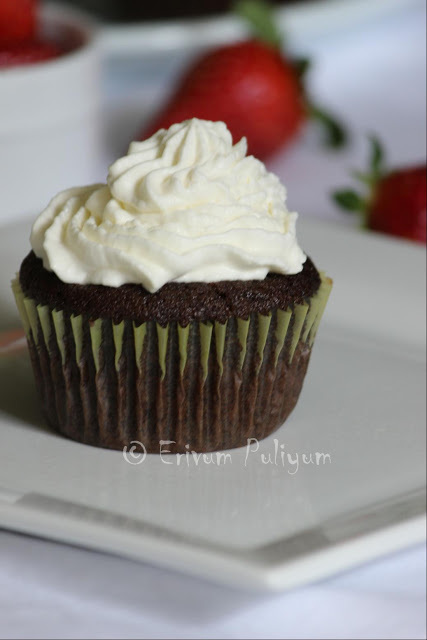 Your photos are amazing; really want a taste! awesome curry...it's my hubby's fav seafood..
Congrats on winning the voucher. Congratulations on the Voucher Win.. I have had squid fry but never a curry!! Looks good! Nalla oru combination,makes me drool. Congrats on ur gift voucher, never tried this gravy, simply mouthwatering!!! congrats on your gift voucher Julie!